Abrar Ahmed Chowdhury, a student of Bangladesh University of Professionals (BUP), who was killed in a road crash in front of Bashundhara gate on Tuesday morning laid to rest. He was laid to eternal rest at Banani graveyard around 4pm today after namaz-e-janaza held at Mirpur Cantonment's BUP ADB ground field. Abrar Ahmed Chowdhury, son of Brig General (retd) Arif Ahmed Chowdhury, was a honors 1st-year student of International Relations Department of the university. 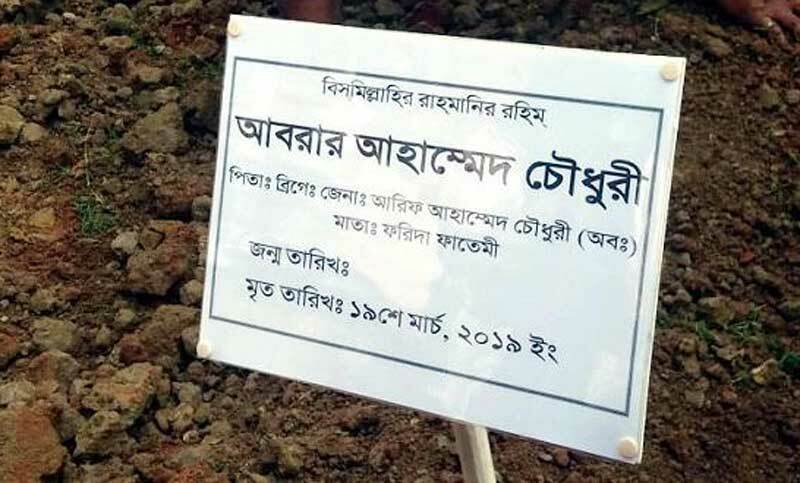 Earlier in the day, the accident took place around 7:30am when a bus of ‘Suprovat Paribahan’ ran over Abrar on Badda-Kuril Bishwa road in the area, leaving him killed on the spot. Scores of agitated students of different private universities in the area have blocked the road in front of Jamuna Future Park protesting the incident.